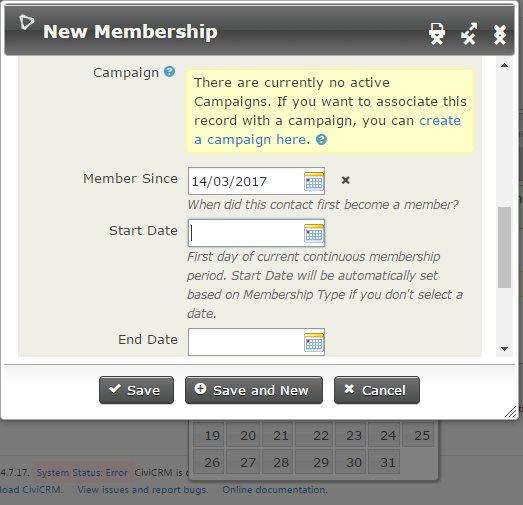 I am unable to use datepicker with popup forms enabled - calendar does not appear active on top of the form but underneath (discovered after reducing and moving the form around). It works with popup forms disabled. Help, please! I suspect you have a WP plugin installed which is interfering. Note the weird double-icons in the top-right of your screenshot. Definitely something extra going on there. Check this list of Wordpress Plugins Incompatible with CiviCRM. Your culprit may be listed. Otherwise, disable all plugins, and, assuming that solves your problem, re-enable them one-at-a-time to discover the culprit. Not the answer you're looking for? Browse other questions tagged forms calendar or ask your own question. How can I set up a two part sign up form, where first submit leads to second with more fields? Add legal_identifier field to contact page and form?